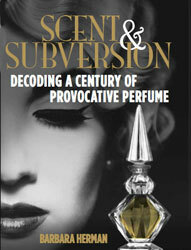 Lila Das Gupta of Basenotes recently interviewed me about vintage perfume collecting, my favorite perfumes, and my upcoming book Scent and Subversion: A Century of Provocative Perfume. Check it out! Enjoy! Again, here's the link. I will update this neglected blog by the end of the week. I promise. A wonderful interview--and you should not be shy about being photographed! (I hate it too, though). Your book sounds wonderful. Thanks, Cheryl Q! I cant wait for it to be finished! Great interview-eagerly awaiting the book! Must be a Barbara thing - I dislike having my picture taken also. Thanks, Barbara! When I see your comments, I always think I accidentally commented on my own posts. :-) And yeah — I absolutely hate having my picture taken. Other people never see you in the same way as you see yourself. You look lovely in the picutre Barbara. Really enjoyed the interview, as I do this blog. Like others, can't wait for your book to come out. I enjoyed the interview and have learned so much here; consult the site often. Thank you, rednails! Youve been a loyal reader and commenter. Thanks for the support. Thanks, brie! Perhaps I am a vampire? ;-) I can't wait to finish the book!! Great interview! It's interesting how you said women's perfumes were more masculine and powerful in the 1920's when we didn't have much power in the work sphere and is getting sparser and girlier now. That's kind of sad: I don't think we need to calibrate our power reserve that way. Can't wait to read this book. Something to look forward to. It amuses me that before I saw this interview and your picture, I got to meet you in person! What serendipity. Great interview! I feel like this happens in fashion too. The 40s with their strong shoulders and masculine styling, and the 60s with dresses you could barely bend over in. I could be overreaching, but, it does seem strange! Nice discussion you have shared on perfume. Thank you for your great support on this issue. What makes your vintage perfume extra special is their bottles. Also, you are not alone being not in to profile picture. I also. And I think it is cool.